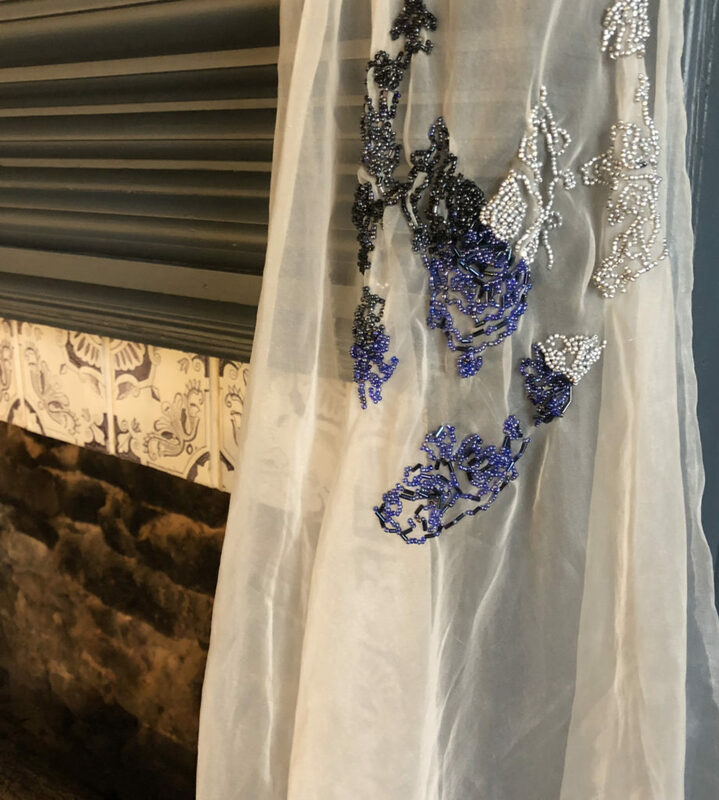 Silk shoe, indigo dyed, hand-stitched and embroidered with Japanese indigo seeds and flowers from my 2018 crop. Made in 2018. Inspired by legend of Eliza Lucas Pinckney, “American mother of indigo,” credited with indigo’s cash crop success in the South from 1745–75. While industrious and enterprising, Lucas’s success rested on the specialized labor of African and Native American slaves who tended the crop and produced dye, a multi-step, arduous process, difficult to systematize for consistent results. Empathy for enslaved laborers and their untold stories has inspired me to grow indigo, which I used to dye the fabric in my above interpretation of a silk shoe worn by Pinckney. 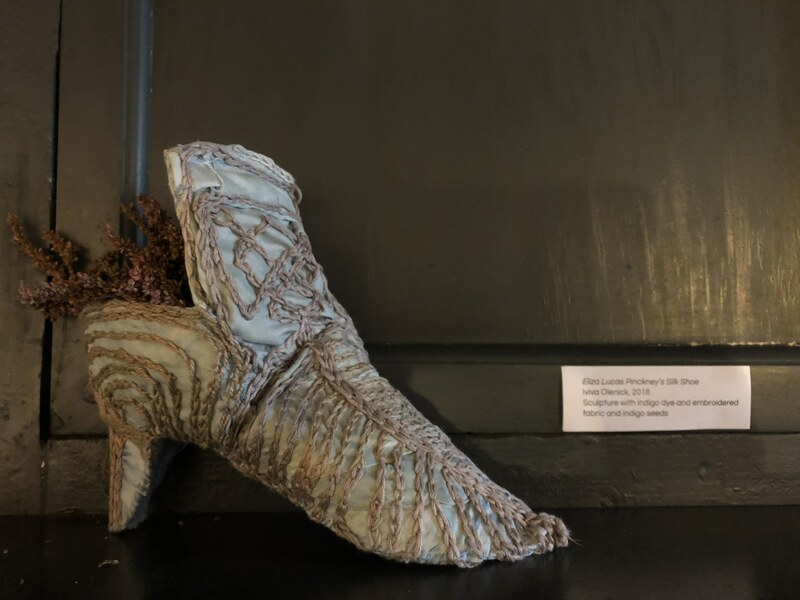 Part of the culminating exhibit of my August 2017–October 2018 Artist Residency at Wyckoff House Museum, I interpreted Dutch design objects and histories of Dutch settlers and Wyckoff family in textiles. 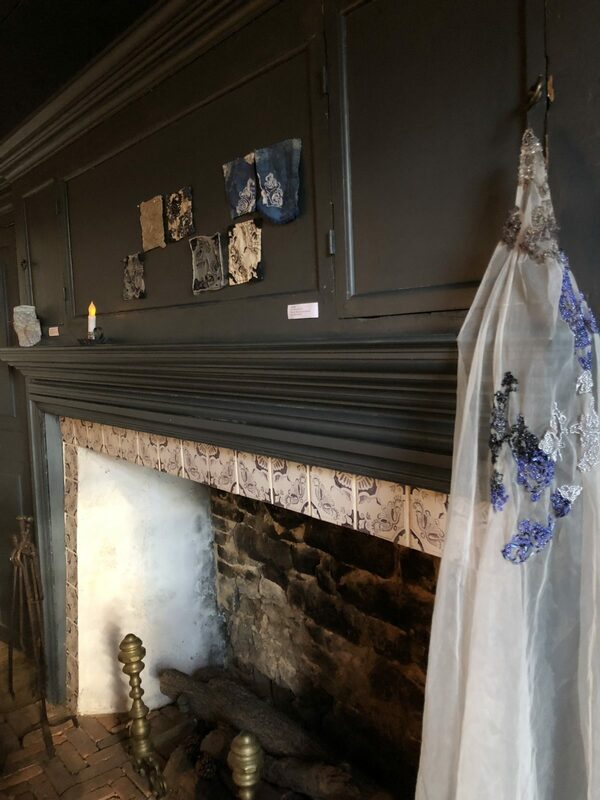 Above the fireplace, mimicking the Delft tiles are my own hand-embroidered and beaded tiles, some dyed with acorns and rust; others dyed with indigo. Some of my versions are incomplete, showing the way we might lose details as we get farther away from historic events. Close-up of one of my recreations of Wyckoff House Delft tiles on a voile fabric using beads to repeat and reinterpret the original pattern. Installed at Wyckoff House Museum. November 2018. Libertad y justicia para todos. Flag with indigo dyed fabric from my 2018 crop; embroidery and beading on fabric. 2018. 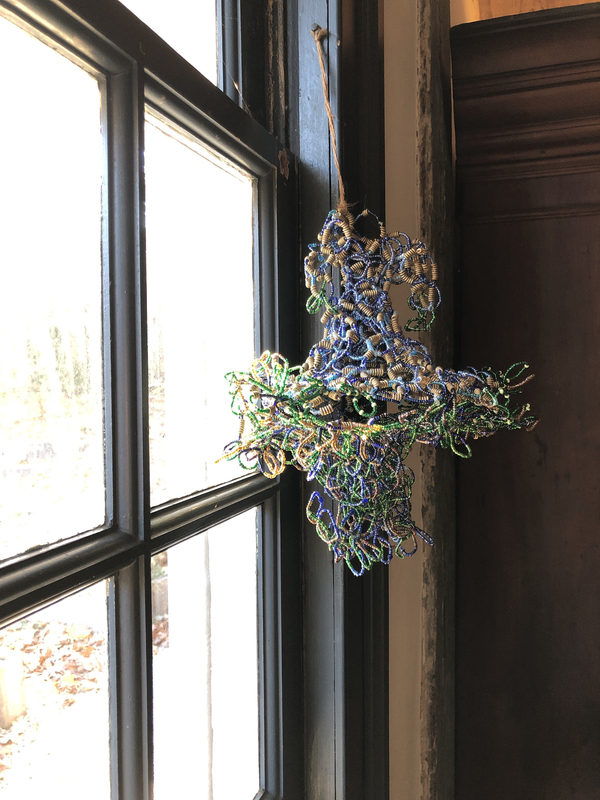 Installed in Wyckoff House in my Artist Residency culminating exhibit, November 2018. 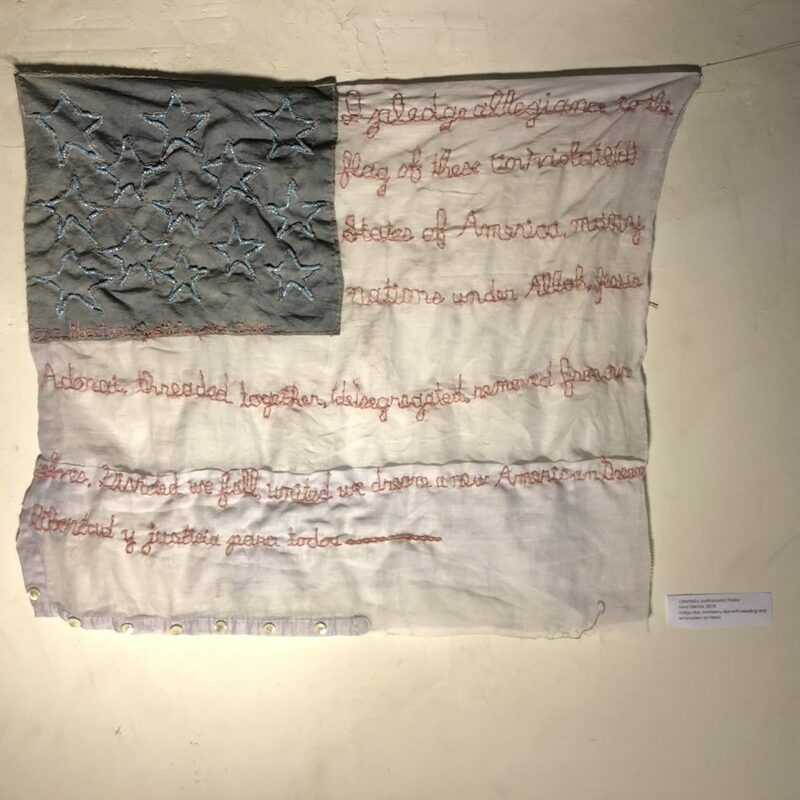 Text reads: I pledge allegiance to the flag of these (in)violate(d) States of America, many nations under Allah, Jesus, Adonai, threaded together, (de)segregated, removed from ourselves. Divided we fall, united we dream a new American Dream: libertad y justicia para todos. Plantation sculpture installed at Wyckoff House in my culminating Residency exhibit. November 2018. Sculpture with beaded, twisted wire visualizing the symbiotic relationship and entrapment of an enslaved agricultural laborer and the plants they were required to produce.